Farmers’ Markets | Park View, D.C. 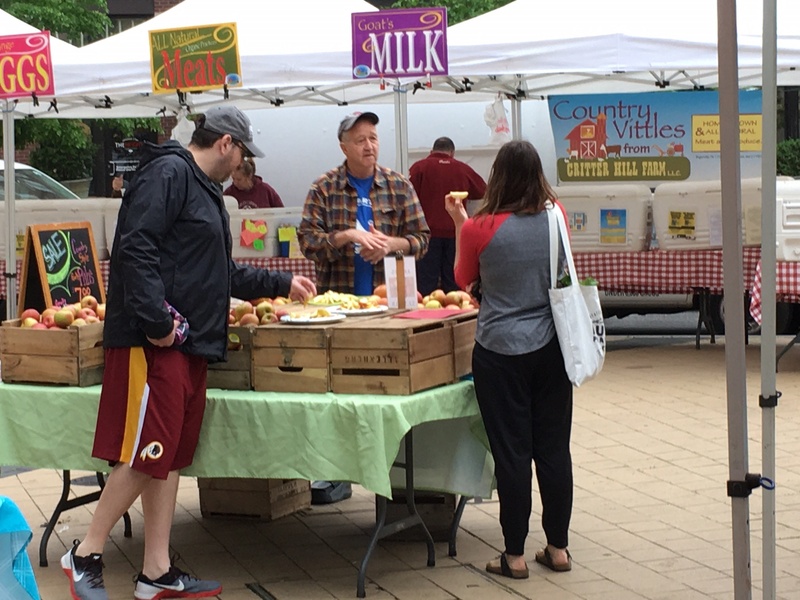 The 2017 season of the Columbia Heights Farmers Market kicked of on Saturday, April 24th. The market will be a regular feature at the Columbia Heights Civic Plaza on Saturdays from 9 am to 1 pm. Beginning on May 31st, 2017, the market will also be open on Wednesday evenings from 4-7 pm. You can see a list of this year’s vendors here, and a few photos from this year’s opening day below. At last night’s meeting of ANC 1A Executive Director of Community Foodworks Jeff Stottlemyer spoke before the assembly about plans to expand the Columbia Heights Farmers Market to Wednesday nights this season. In April Community Foodworks that was awarded a grant as a partner on a groundbreaking national health and nutrition initiative led by Wholesome Wave. The grant provides funding to help us launch an innovative CSA program for low-income customers who can pay with SNAP, which will be one of the first of its kind in the country. Community Foodworks is the only partner on the national initiative in Washington. The program will be launched soon as part of a suite of new health-focused partnerships with other community organizations (e.g., We Are Family and La Clinica Del Pueblo) based at a pilot Wednesday evening market, which is also being supported by the grant. 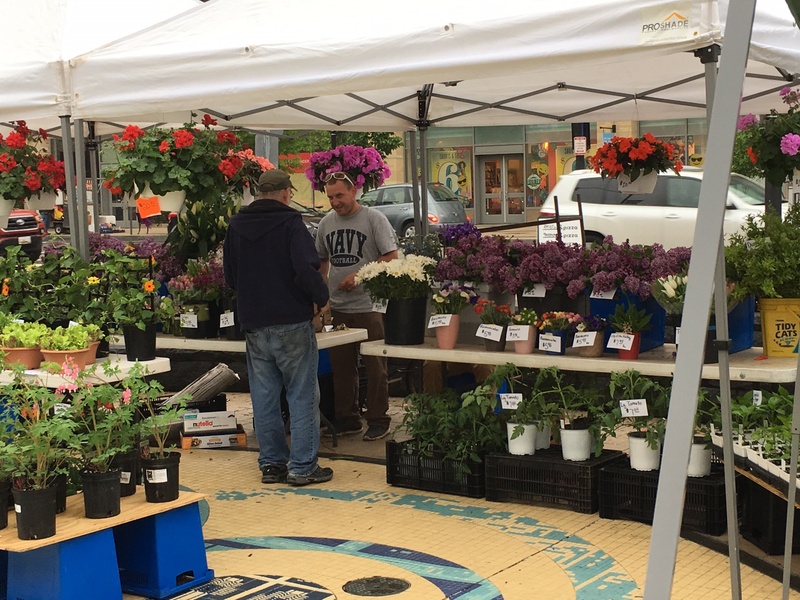 The goal is for the market to take place from 4-7:30 p.m. during the summer months; it will be roughly half the size of the regular Saturday market, no vehicles will be parked on Kenyon Street during market hours, and the Columbia Heights Civic Plaza fountain will remain on. 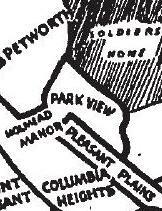 This weekend marks the start of both the Petworth and Columbia Heights Marketplaces 2013 seasons. 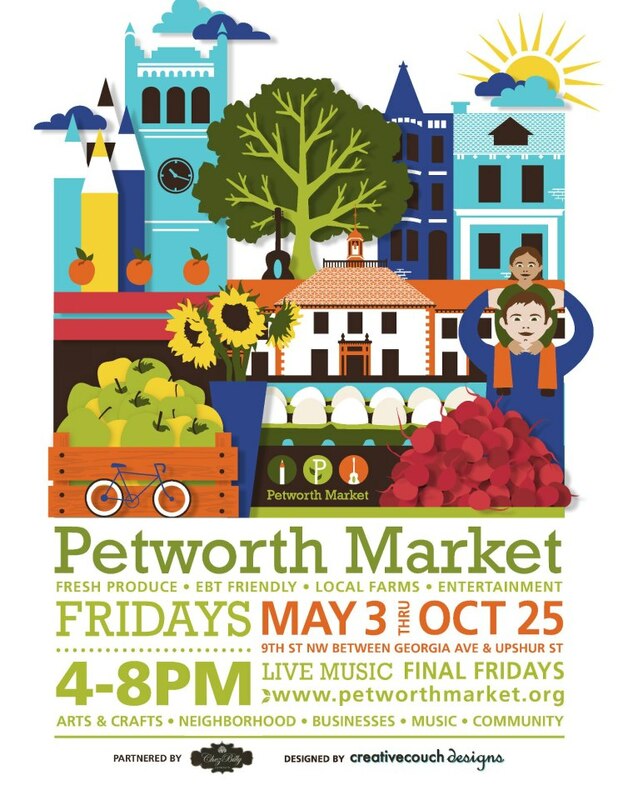 The Petworth Community Market kicks off this Friday, May 3rd, from 4 – 8 p.m. According to an announcement by the market — you can snag fresh fruits, local vegetables, eggs and more! They will be reintroducing their SNAP and WIC programs plus the vendors take credit cards! They’ll have music, a cooking demo by Chez Billy’s Chef Brendan and friendly neighbors to boot. The Columbia Heights Community Marketplace starts the season this Saturday, May 4th, from 9 a.m. – 1 p.m. According to their Website, the Columbia Heights Community Marketplace launched as a vehicle to bring local, sustainably grown food and art made by local artists to the people of Columbia Heights. 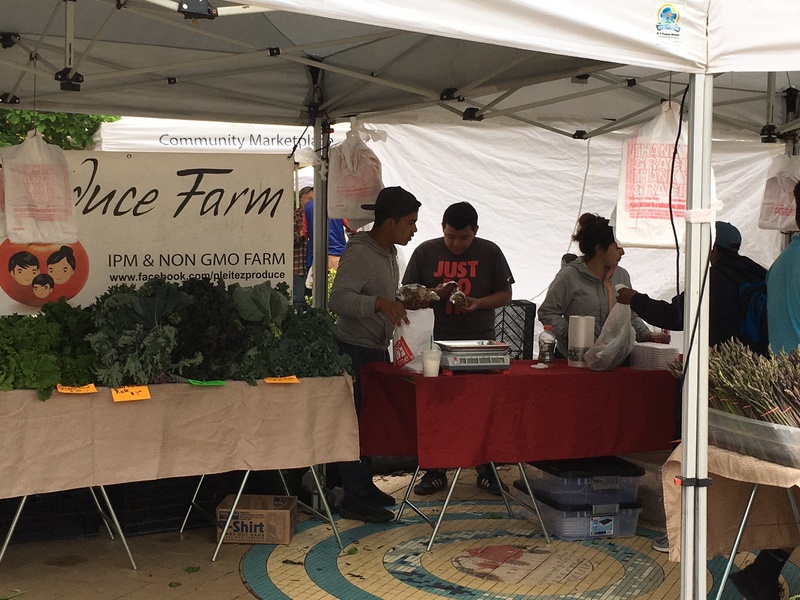 Their vibrant farmers market, Festibucks matching incentives program that helps low-income residents get more food with their nutrition benefits, and their urban agriculture educational work are promoting the health of Columbia Heights and its people. Both markets are great assets to the area that you’ll want to visit repeatedly this season. Opening day of the Columbia Heights Community Marketplace is tomorrow, Saturday, May 12th. The Community Marketplace unites residents, local farmers, food producers, artists, performers, and neighborhood service groups to meet, mingle, and enjoy all things local from 9 a.m. to 1 p.m. every Saturday from May 12 through December 15, 2012. Marketplace visitors enjoy fresh, locally grown fruit, vegetables, meats, eggs and other food from local farms, as well as other unique and specialty items. The Columbia Heights Community Marketplace happens in the civic plaza, located at the intersection of 14th Street and Park Road, NW (one block from the Columbia Heights Metro Station and across from Giant, Target and Tivoli Theater). This season, the Marketplace will continue our successful Festibucks program, which helps individuals receiving federal nutrition assistance buy more fresh, nutritious food than they could with just their benefits. We also are starting a cutting edge Fruit and Vegetable Prescription program with the Upper Cardozo Health Center and DC Greens. 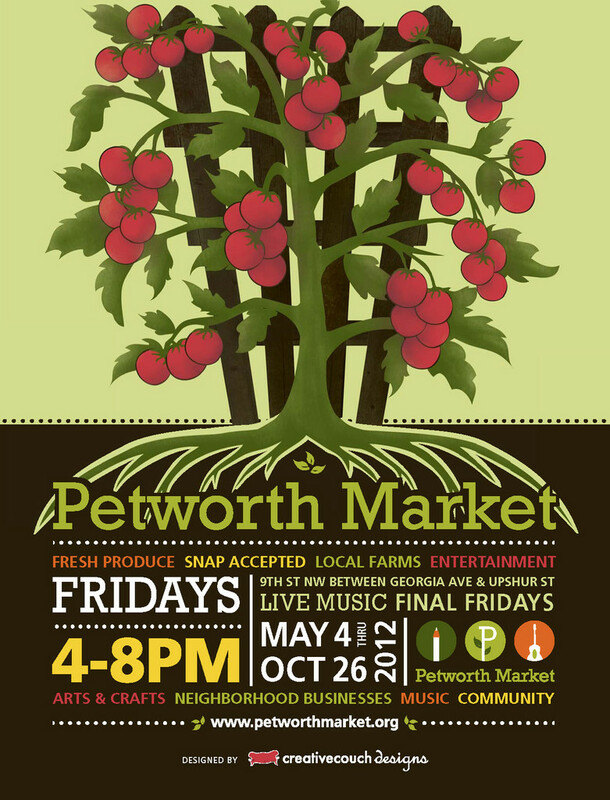 Now in its third season, the Petworth Community Market (PCM) runs Fridays, 4 p.m. to 8 p.m., from May 4 through October 26. What’s new at the market this year? Expanded season: Due to input from customers and vendors last year, the market season has been extended for an additional month. Expanded Bonus Dollars Program: Once again, the Petworth market will accept SNAP/WIC benefits and offer a Bonus Dollars program. Those who spend $10 or more in SNAP (Supplemental Nutrition Assistance Program — formerly food stamps) will receive $10 in Bonus Dollars from PCM. The expanded offering is thanks to our successful fundraiser bash at Domku last week as well as a contribution from the Ward 4 Constituent Services Fund courtesy of Councilmember Muriel Bowser! More Music: The Final Friday of each month will feature special musical performances to bring out families and neighbors. Kids Corner: A designated space with activities for the little ones. More Vendors: Nearly 20 vendors (see below) will sell their wares and food products at the market. Today, visit the market on Ninth Street, NW between Upshur Street and Georgia Avenue with neighbors, Advisory Neighborhood Commissioners and key partners to help ring in the market’s opening at 4 p.m. in style. The opening will feature a watermelon cutting and entertainment provided by local musicians Brian Fenke (4-6pm) and Eminence Band (6-8pm), so bring your dancing shoes! Credit cards are accepted at the market. Here’s a fundraising event the anyone who has enjoyed or shopped at the Columbia Heights Community Marketplace should be aware — their Second Annual Harvest Evening. 6:00 p. m. – 9:00 p.m.
Tickets available at the Marketplace every Saturday or buy online. 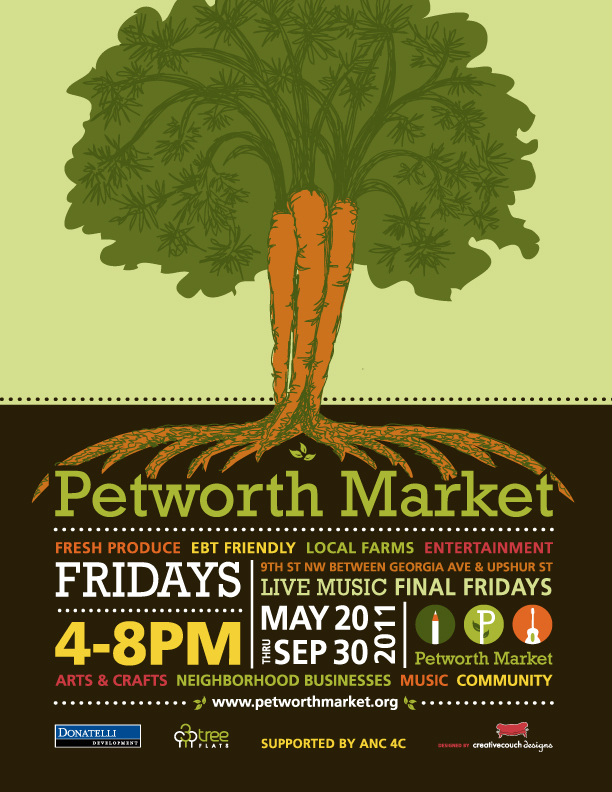 The Petworth Market starts today, Friday, May 20. The market runs Fridays, 4 PM to 8 PM, through September 30, along Ninth Street at the intersection of Georgia Avenue and Upshur Street, NW. Special events will occur throughout the summer, including chef demonstrations, artist appearances and local musicians. On the last Friday of each month, the market will feature live music from a variety of local bands. 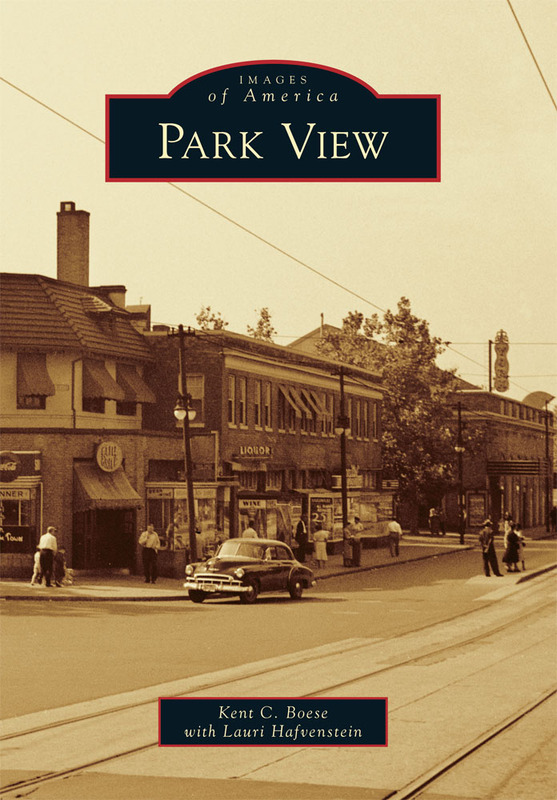 The 2011 market season is sponsored by ANC 4C, 3 Tree Flats and Donatelli Development.